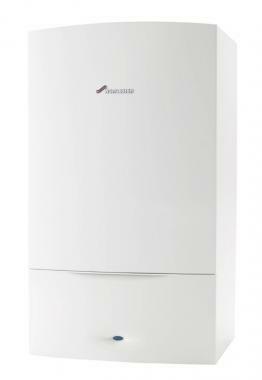 The Worcester-Bosch Greenstar 30CDi Conventional is a wall mounted gas fired conventional also known as heating only boiler. The appliance combines a cast aluminium heat exchanger fan and pressure release valve in a single unit but feed and expansion cisterns in your loft and a hot water storage cylinder are also required. Indeed the capacity of the hot water storage cylinder largely determines the availability of hot water within your household. Typically, however, the Worcester-Bosch Greenstar 30CDi Conventional is suitable for installation in small or medium-sized households with traditional central heating and domestic hot water systems. Such systems may benefit from the reduced pressures associated with the Worcester-Bosch Greenstar 30CDi Conventional in comparison to a combi (combination) or system boiler.